As you may have already heard, Samsung plans to attempt to throw its weight in the already crowded messaging app arena, with their upcoming ChatON service. For those not in the know, it's a cross-platform messaging service with apps for Android, Bada, iOS, BlackBerry and Samsung feature phones, launching next month. The question is, does the world really need yet another messaging app? Sure Samsung have a large user base to leverage. They'll probably bundle it into TouchWiz on Android, and integrate it into their own Bada OS. But with so many current offerings, why should Samsung believe everyone will use theirs. It's free, global, cross-platform and has all the features you'd expect for advanced messaging. But it just feels far too much "me too". It seems like it could be a perfectly good messaging app, but why switch from what already works? 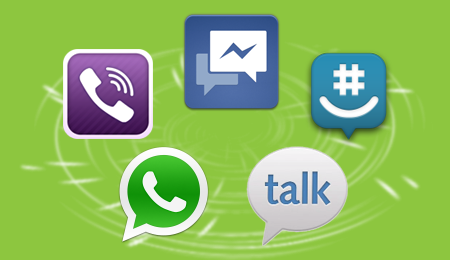 WhatsApp, while costing $1.99/year, seems to be the most popular at the moment, and definitely covers plenty of platforms, with Android, iOS, BlackBerry OS and Symbian apps on offer. They even support a (very) small range of S40 phones. Viber is also gaining traction thanks to its VoIP abilities, with Android and iOS offerings, and Windows Phone 7 in the pipeline, although its messaging is limited to just text. Google and Facebook entered this market recently too, but I feel they both slipped up a bit on this. Facebook Messenger is nice, works quite well and already has most of your friends you actually talk to. Away from your phone, you can use chat or messages in browser, so you don't need to worry if your mate has it installed. But they limited the launch to the US (but you can get an APK to install here), which was a big let down. Meanwhile, Google Talk is a great IM network, and although it only has an official client for Android, it can be used on just about any mobile or desktop OS, and has a solid web interface. So it really doesn't make sense for them to launch Huddle, a completely separate IM network that ties into Google+. The Google+ tie-in is great, as it solves the user base problem, but why not build this on top of Google Talk? Upgrade Google Talk with the features of Huddle, and release on a wide variety of platforms. At the end of the day, it comes down to the same problem: "What app does X use? ", and Samsung is just adding the list of possibilities. There's one solution staring us in the face. One way we can all use whatever app we want, at least for basic messaging. Google and Facebook are already half way there. The solution is XMPP with server federation. XMPP is an open protocol for instant messaging that anyone can implement and extend. Server federation allows different XMPP servers to talk to each other. It's what allows you use Google Talk to chat with a friend on AIM. If all these IM apps used XMPP at their core, and built upon it for their additional features, we would have no issue with at least basic text-based chat, which is all most people want. It's not a perfect solution; you still need to know what network your friends are using to add them, but there's no more wondering which app you need to open, just to send a quick text. Both Google and Facebook support XMPP already sans advanced features such as location and contact sharing, but only Google supports server federation. Unfortunately, this is an unlikely haven just out of reach. Too few services support XMPP with server federation to be a selling point, so companies will continue to push their services, further differentiating and making users even more confused. So I'll continue to have six (yes six!) messaging apps installed on my Galaxy S II, and barely use them because it's too hard to choose one. I'll probably install ChatON when it's released and further push myself into this "What app does X use?" mindset that I so badly want to escape.